HOMEMADE STRAWBERRY ICE CREAM with no eggs! This homemade recipe is easy to make in your ice cream maker and is filled with fresh strawberries! It’s made with heavy cream, half and half and is eggless! This is one of the best Summer dessert recipes to eat! The ice cream cravings are out of control this week! With the mixture of Summer temperatures, fresh strawberries growing in the garden and craving cold ice cream, I broke our ice cream maker out of the cabinet and made this Strawberry Ice Cream With No Eggs! Eggs are often included in making delicious ice cream but I’m a believer that they aren’t necessary for creating some of the best, homemade ice cream. 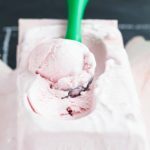 This ice cream includes half and half, heavy cream, sugar, vanilla extract, a dash of salt and lots of fresh strawberries – and trust me, that’s all you need! The taste of this ice cream has the perfect strawberry ratio to it, with the strawberry taste shining through. I recommend taking your strawberries and pureeing them every so slightly so they’re a good mashed consistency, but be careful not to puree them too much! 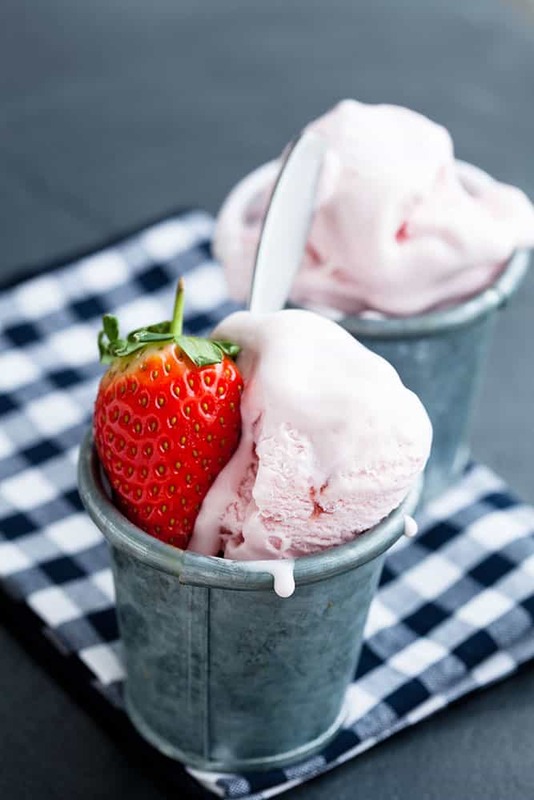 Make sure your ice cream maker’s bowl is in the freezer ready to go all Summer long, so whenever the craving hits this Strawberry Ice Cream With No Eggs can be minutes away! When the ice cream is done processing in the bowl I always add it to this ice cream tub for fresh keeping – but it never lasts that long because it’s too delicious! Scoop away and enjoy! Looking for other ice cream recipes? Make sure to try my favorite chocolate ice cream and the easiest banana “soft serve”! 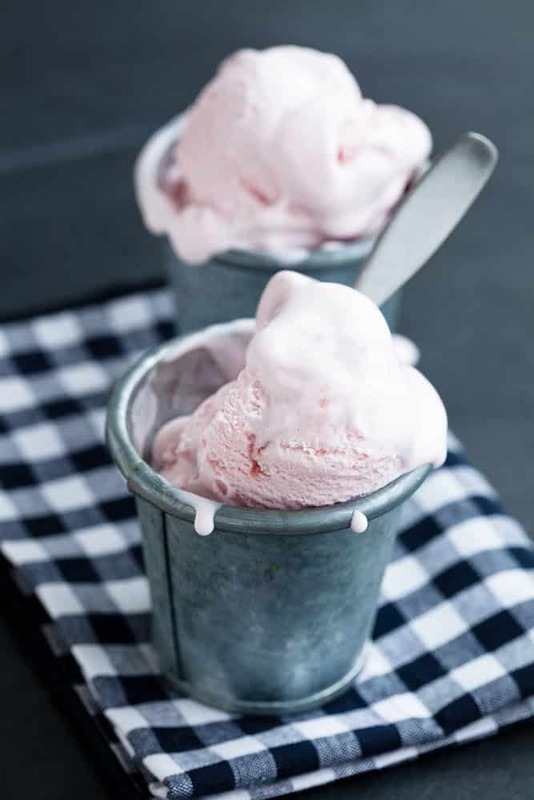 HOMEMADE STRAWBERRY ICE CREAM with no eggs! This homemade recipe is easy to make in your ice cream maker and is filled with fresh strawberries! It's made with heavy cream, half and half and is eggless! This is one of the best Summer dessert recipes to eat! 2 1/2 cups fresh strawberries - stems removed and pureed slightly to mash them. Add all ingredients to a large bowl and stir to combine. Pour mixture into the ice cream maker bowl and process/ freeze according to the ice cream maker's instructions. This is the kind of ice cream recipe I get super excited about finding!! I am always a little overwhelmed by the number of egg yolks a recipe will ask for. I love how simple this sounds. Yum!! So very creamy! Great that it’s eggless too. I loooooove that color. Such a pretty pastel pink and that creaminess…..WHOA!!! Those cute little buckets are adorable! Home-made strawberry ice cream is the best!! Yum! *pinning! * Have a great weekend Pamela!! OHMYGOSH! This looks so much like my dad’s homemade strawberry ice cream recipe—he didn’t think it needed eggs, either! Just that clean, refreshing texture of iced cream and strawberries is creamy enough! I can’t wait to try this. Thank you, Pamela!!!! That makes me happy to hear Lyndsey, hope you enjoy it and that it tastes just as good as Dad’s ice cream! This ice cream looks amazing. There isn’t anything better than those beautiful fruits that we get to work with this time of year! Your photos are always delicious! 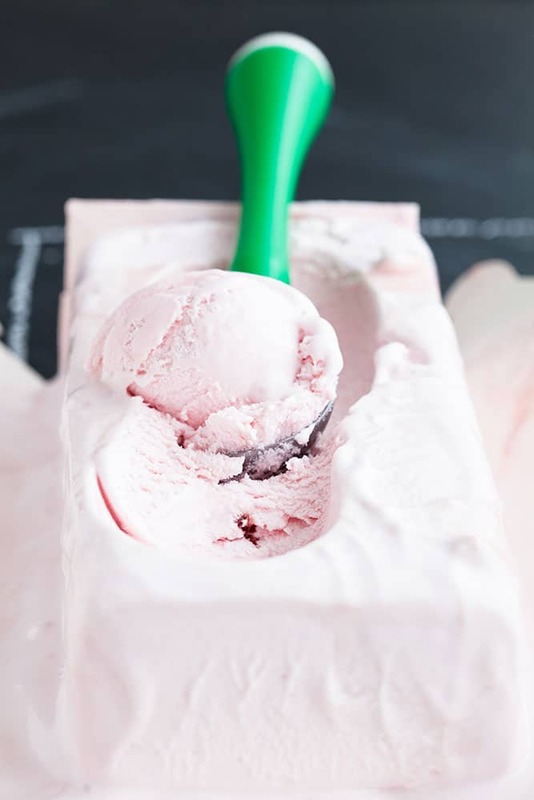 MMMMMMMMM…..refreshing strawberry ice cream!! That texture looks like perfection! WOW, Looks so perfect, homemade icecream really tastes so much better than store bought. This is such a great recipe Pamela. Recipe looks wonderful, but….I seem to confused myself….is it 2 1/2 cups whole strawberries, 2 1/2 cups chopped strawberries, or 2 1/2 cups pureed strawberries? Hoping to make this for the 4th! Thanks! Hey Sue, it’s 2 1/2 cups whole strawberries. It makes a great 4th ice cream – enjoy! Oh Thank you!!! Big difference in the amount of whole vs pureed! looks fantastic, thanks for sharing this and your other recipes on craft schooling sunday! Oh, this sounds amazing! It reminds me of the very first time I made homemade ice cream. That recipe is long gone now, so I’m saving this one. Thanks!! Strawberry ice cream is one of my favorites! I need to try your variation soon! I want to dig into it right away. Can I even tell you how much I’m craving strawberry ice cream after reading this? OMG YUM! I’ve never made ice cream without making a custard first, so I can’t wait to give this a try. Thanks so much for sharing at the #happynowlinkup! This looks like amazingly delicious ice-cream. I must try the recipe. Making homemade ice cream is a favorite. No eggs is great, lucky in our family it doesn’t matter. 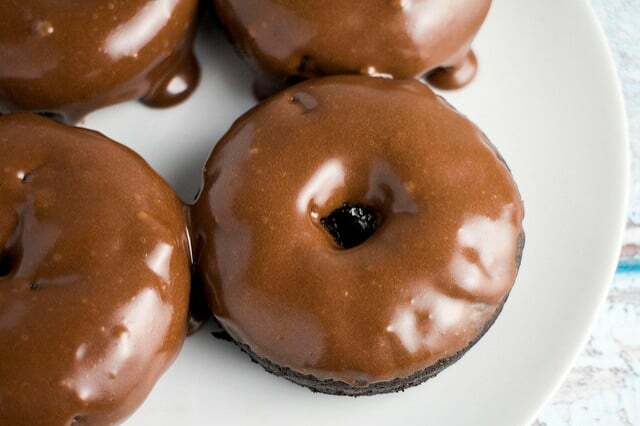 This looks so darn delicious! I must try it out. Thanks. We love homemade ice cream. I can’t wait to try this, love the simple list of ingredients. Yay to not having to waste a bunch of egg yolks! This ice cream sounds magical. Love the color ! Homemade always better! This strawberry ice cream is looks delish. I would try it out this summer. How gorgeous are those pictures you must be happy with them and the icecream. What a great recipe. We also love ice cream made w/o eggs because it really likes the flavor shine. 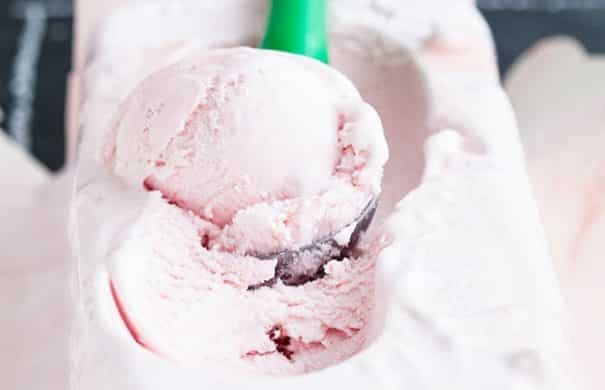 It makes perfect sense for strawberry ice cream because it’s so hard to extract a ton of strawberry flavor into it with all the other ingredients. Looks so good, Pamela! Thank you so much for sharing an ice cream recipe without eggs! I’m looking forward to trying this. I love your beautiful photographs too. I’m a sucker for pretty food photography. A great summer recipe. Yum! This looks SO delicious! You will be featured at the next To Grandma’s house we go party starting tomorrow morning, thanks for sharing with us! This recipe sounds simple and delicious Pamela!! I’ve pinned it so I can make it later. Thank you for linking it up at Create, Bake, Grow and Gather this week. I’m delighted to be featuring it at tonight’s party. This looks delish!! I love the fact that it doesn’t have eggs. Bookmarking to try soon. Hope to see your ice cream at the collection (the perfect party addition)! Awesome recipe! I loved Ice Cream and made it tomorrow in my home everyone just loved it! Thanks for sharing this for us. what is the 2nd ingredient with 1 cup half and half? Half-and-half, also known as half cream in the United Kingdom, is a blend of equal parts whole milk and light cream. Hope this helps! This looks like my kids would definitely love! I could not find Half and Half in the local supermarket (I am visiting friends in Latvia). Should I replace it with milk or light cream? Hey Barbara, you can use 1/2 cup whole milk and 1/2 cup light cream instead for the 1 cup of half and half. Enjoy!